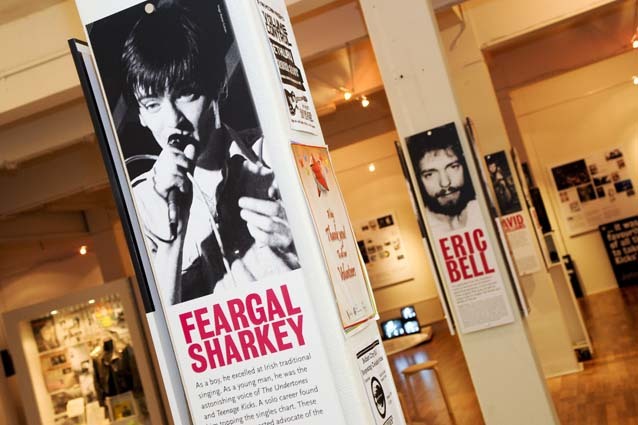 The exhibition consists of four elements including a series of storyboards plotting the history of Northern Ireland music from folk to Snow Patrol and audio visual displays showing the likes of Them, The Undertones, Stiff Little Fingers and Gary Moore. A ‘Legends’ series of wall displays hail the great achievers in Northern Ireland music while exhibition cases showcase some unique rock and roll memorabilia, including the Fender guitar that Snow Patrol’s Gary Lightbody used to write Run and Chasing Cars, a vintage street sign of Cyprus Avenue, made famous in a Van Morrison song, and a specially arranged exhibit of Gary Moore memorabilia kindly donated by his family. The NI Music Exhibition is currently in receipt of support from Heritage Lottery Fund for a project titled Preserved, Catalogued and Revived to support Oh Yeah in the preparation required to undertake a musuems standard accreditation process.